When I was growing up in England, I knew spring had finally arrived when my grandmother started tossing young, freshly shelled peas just barely blanched in boiling water with chopped fresh mint and a generous knob of butter. I loved the pure, sweet flavor of those peas and their amazing tenderness, with just a hint of crunch. They were available for only a few short weeks, so we ate them almost every day until we could no longer find them at the store. Fast-forward a couple of decades. Not much has changed now that I’m a chef in New York. In May, when mounds of green pea pods begin to appear in local markets, I buy pounds of them several times a week so I don’t miss out on this rare spring treat. 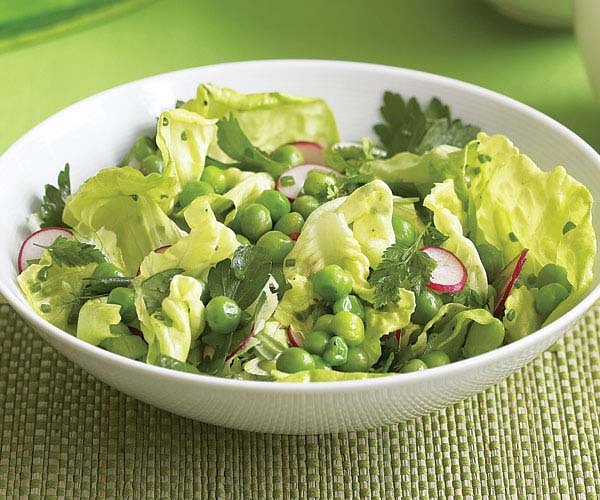 And while I admit that shelling all those peas isn’t my favorite activity, having lots of fresh, sweet, bright-green peas at hand to make tasty side dishes or to toss in salads or pastas is the ultimate indulgence of the season—and more than enough reward for a little time spent shelling. Choose small, very fresh peas. For best flavor, choose small peas, which are younger, sweeter, and more tender than large ones, and make sure they’re as fresh as possible. 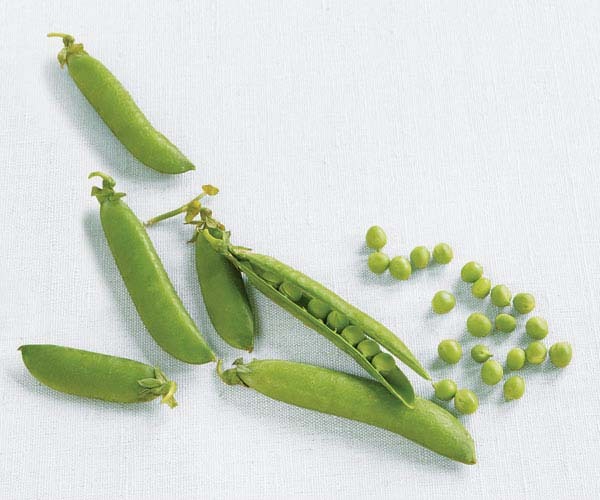 Once picked, peas’ high sugar content changes, causing them to lose much of their sweetness and become starchy and dull. You know peas are fresh when their pods are firm and green, so avoid any that are yellowing or wilting. Go for medium pods rather than large, thick-skinned ones, which are more mature and contain larger, tougher peas. Break open a pod and check the peas inside. They should be small, bright green, and firm; if you taste one, it should be tender and sweet. 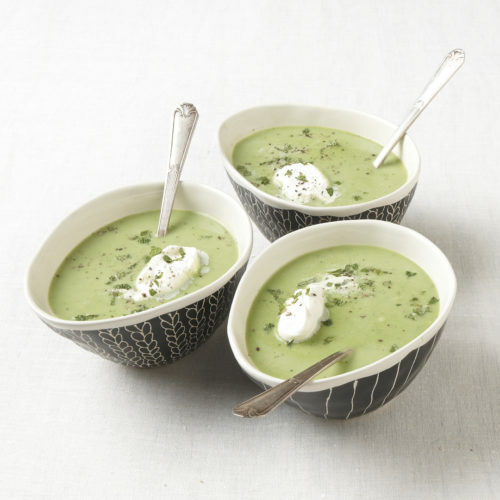 If all you can find are large, mature peas, opt for frozen peas instead. Mature peas are not as tender and sweet as young ones, and they’re less versatile. They need to be cooked longer and more slowly, and I find that their firmer texture works well only in stews and braises. Use them quickly or freeze them. Peas don’t have much of a shelf life, so I don’t recommend storing them —in their pods or shelled—for very long. Store pods in a plastic bag in the crisper drawer of the refrigerator and use them within a couple of days. Once they’re shelled, the best way to store peas is to freeze them. First blanch them for a minute or two in boiling salted water and then shock them in an ice-water bath until cool, to help maintain their bright color. Drain and freeze them in zip-top bags. They will keep for five to six months. What I also like about peas—aside from their sweet flavor—is that they take only a few minutes to cook, particularly when they’re very fresh and young, so they’re a perfect ingredient for fast weeknight dishes. In fact, the secret to maintaining their sweetness and bright-green color is to cook them as little as possible, just enough to make them tender. What’s more, peas lend themselves to almost any cooking method, from boiling and steaming to sautéing, stir-frying, and quick-braising. You can make them the star of a side dish, as in my quick-braised peas, purée them into a soup, add them to a stew, or briefly blanch them and toss them in risottos or pastas. And when they’re small and tender, they’re also great raw in salads. 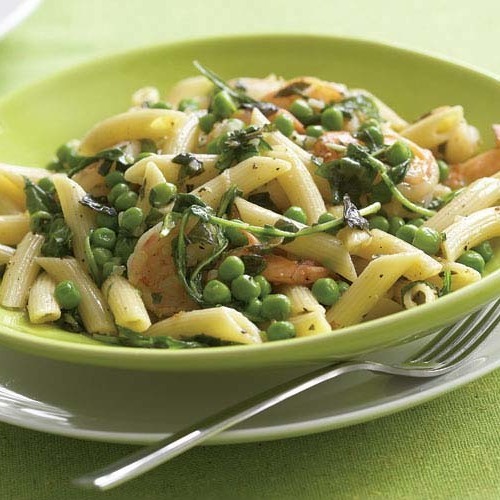 Peas’ mild sweetness pairs well with many different flavors. Cured meats like bacon, pancetta, prosciutto, smoked ham, and chorizo work wonderfully with peas, as their pronounced saltiness complements peas’ gentle flavor. 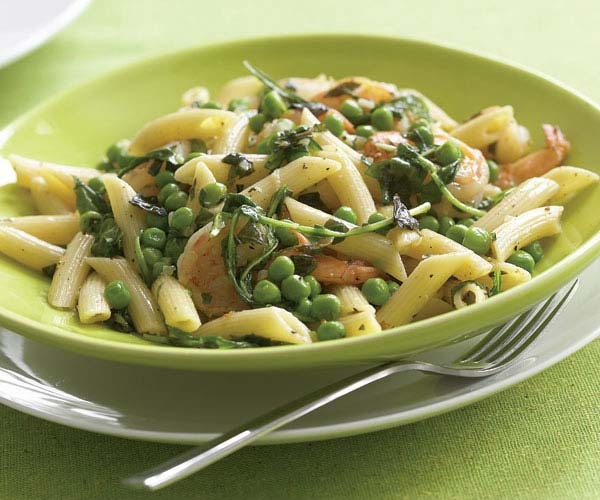 Fresh mint is also a classic flavor partner, bringing peas to life in an instant. 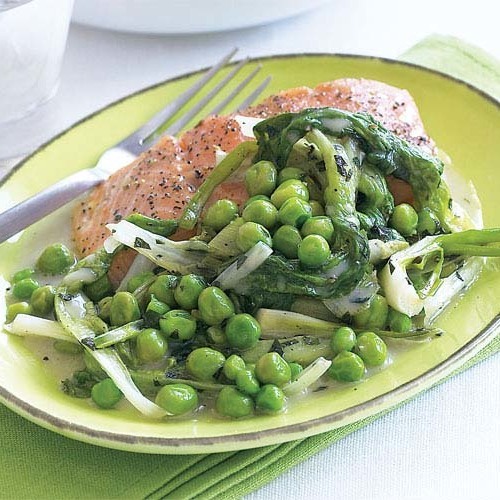 But I also like pairing peas with other fresh spring herbs such as basil, chervil, chives, dill, and tarragon. 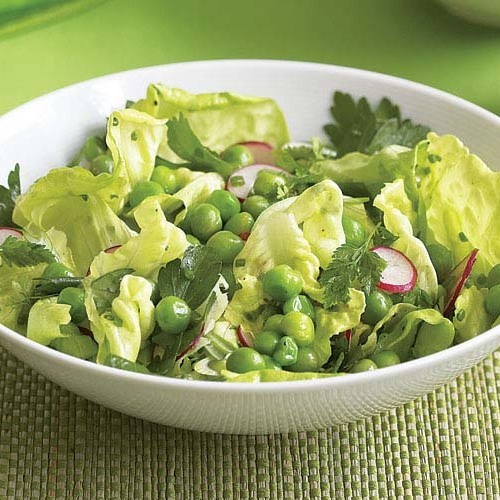 Peas are a natural with onions, scallions, and other alliums, and they pair well with other spring vegetables like asparagus, new potatoes, carrots, and fava beans. 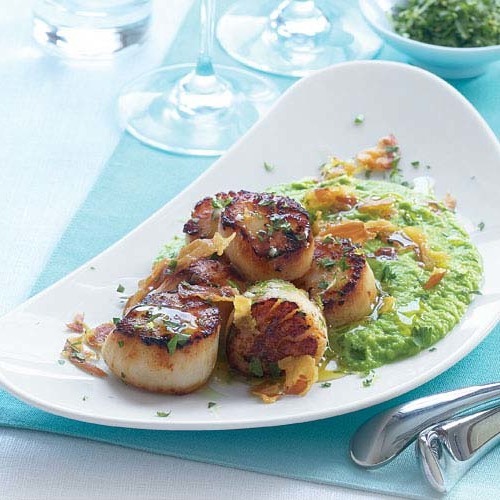 When I cook peas as a side dish, I serve them with chicken, lamb, or duck and with any kind of fish, especially cod, salmon, and scallops. In a pinch, use frozen peas. If you can’t find good fresh peas or you crave peas when the season’s over, frozen peas are a terrific alternative. They’re usually picked when they’re young and tender and immediately frozen, so they will often taste sweeter than fresh peas that have been hanging around for too long. You can use frozen peas in all these recipes if sweet fresh ones aren’t available. 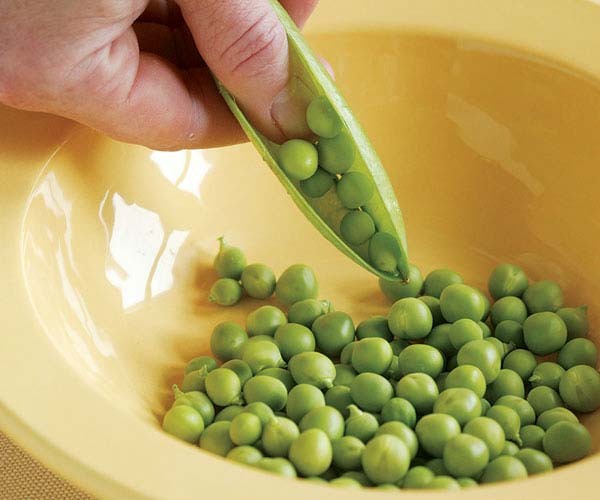 When buying fresh peas, remember that 1 pound of peas in their pods yields about 6 ounces (1 cup) shelled peas. Don’t throw those pods away—make broth. After you’ve shelled all those peas, save the empty pods for making a simple pea broth, which you can use to enhance the flavor of soups, stews, and braises, including the ones here. To make the broth, put the pods in a large pot and cover with water by at least 1 inch. Add a pinch of salt and a roughly chopped onion. Simmer for about 25 minutes, strain, and discard the pods. The broth will keep for two days in the refrigerator and for about a month in the freezer.